The goal of this project is to meet the increasing demand for realistic haptic feedback with a simple haptic display that can present realistic sensations of objects. The project team focused on the mass of a virtual object, which contributes to weight and inertia in haptic interaction. If the virtual mass is presented by a haptic device, the user perceives a more realistic sensation of the virtual object. Conventional wisdom assumes that it is necessary to reproduce proprioceptive sensation in order to present a weight sensation, so most haptic displays that present virtual weight are designed to reproduce the proprioceptive sensation with heavy, grounded devices. However, deformation of the fingerpads due to the weight of an object can generate a reliable weight sensation even when the proprioceptive sensations on the wrist and arm are absent. This enables realization of a simple, wearable haptic display for virtual weight. Gravity Grabber reproduces fingerpad deformation with a small pair of motors and a belt. To present a grip sensation, the dual motors are driven in opposite directions of rotation so that they roll up the belt, which delivers a vertical stress to the user's fingerpad. To present a gravity sensation, the motors are driven in the same direction of rotation. 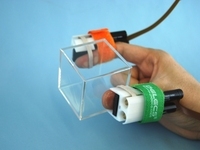 With these devices on their index fingers and thumbs, users can perceive virtual grip, gravity, and inertia on their fingerpads during various behaviors such as shaking and rotational motion.